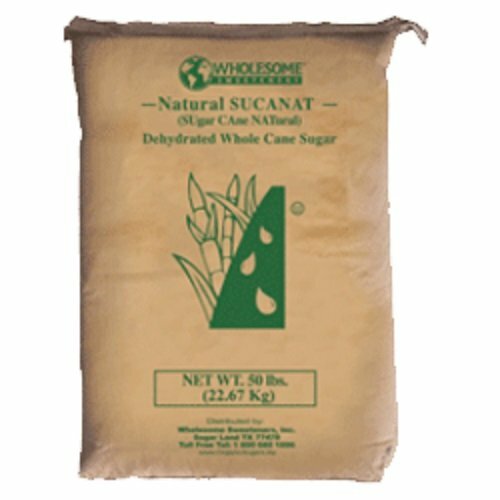 Wholesome Fair Trade Organic Sucanat (which stands for Sugar Cane Natural), is a whole unrefined cane sugar. In fact, it’s the least refined cane sugar you can find outside of a cane stalk. It’s made by simply crushing freshly cut sugar cane, extracting the juice and heating it in a large vat. Once the juice is reduced to a rich, dark syrup, it is hand-paddled. Hand paddling cools and dries the syrup, creating the flavorful dried granules we call Sucanat. Nothing is added and nothing is taken out! It contains trace amounts of iron, calcium, vitamin B6, potassium and chromium. No chemicals, bone char, or animal by-products are used to make or de-colorize this sugar making it ideal for vegans too. Wholesome Fair Trade Organic Sucanat is made from 100% certified organic sugar cane in the heart of Costa Rica. Because Sucanat still contains all of the cane’s natural molasses, it has a deep brown color and a distinct, natural molasses flavor that enhances many foods. It is naturally gluten-free, and can be substituted for brown or white sugar or in any recipe and it is especially good in chocolate-based recipes, baked goods, BBQ sauces and marinades. The Fair Trade Certified logo is Wholesome's guarantee that our farming cooperatives are paid directly for the cane grown and milled. This means that farmers can compete with factory farms, cultivate the quality of their crops, send their kids to school and build thriving communities. Thank you for choosing Wholesome! If you have any questions about this product by Wholesome Sweeteners, contact us by completing and submitting the form below. If you are looking for a specif part number, please include it with your message.